Where will the new jobs come from ? Optimism remains the right starting-point, but for workers the dislocating effects of technology may make themselves evident faster than its benefits (see article). Even if new jobs and wonderful products emerge, in the short term income gaps will widen, causing huge social dislocation and perhaps even changing politics. Technology’s impact will feel like a tornado, hitting the rich world first, but eventually sweeping through poorer countries too. No government is prepared for it. Why be worried? It is partly just a matter of history repeating itself. In the early part of the Industrial Revolution the rewards of increasing productivity went disproportionately to capital; later on, labour reaped most of the benefits. The pattern today is similar. The prosperity unleashed by the digital revolution has gone overwhelmingly to the owners of capital and the highest-skilled workers. Over the past three decades, labour’s share of output has shrunk globally from 64% to 59%. Meanwhile, the share of income going to the top 1% in America has risen from around 9% in the 1970s to 22% today. Unemployment is at alarming levels in much of the rich world, and not just for cyclical reasons. In 2000, 65% of working-age Americans were in work; since then the proportion has fallen, during good years as well as bad, to the current level of 59%. Worse, it seems likely that this wave of technological disruption to the job market has only just started. From driverless cars to clever household gadgets (see article), innovations that already exist could destroy swathes of jobs that have hitherto been untouched. The public sector is one obvious target: it has proved singularly resistant to tech-driven reinvention. But the step change in what computers can do will have a powerful effect on middle-class jobs in the private sector too. Until now the jobs most vulnerable to machines were those that involved routine, repetitive tasks. But thanks to the exponential rise in processing power and the ubiquity of digitised information (“big data”), computers are increasingly able to perform complicated tasks more cheaply and effectively than people. Clever industrial robots can quickly “learn” a set of human actions. Services may be even more vulnerable. Computers can already detect intruders in a closed-circuit camera picture more reliably than a human can. By comparing reams of financial or biometric data, they can often diagnose fraud or illness more accurately than any number of accountants or doctors. One recent study by academics at Oxford University suggests that 47% of today’s jobs could be automated in the next two decades. At the same time, the digital revolution is transforming the process of innovation itself, as our special report explains. Thanks to off-the-shelf code from the internet and platforms that host services (such as Amazon’s cloud computing), provide distribution (Apple’s app store) and offer marketing (Facebook), the number of digital startups has exploded. Just as computer-games designers invented a product that humanity never knew it needed but now cannot do without, so these firms will no doubt dream up new goods and services to employ millions. But for now they are singularly light on workers. When Instagram, a popular photo-sharing site, was sold to Facebook for about $1 billion in 2012, it had 30m customers and employed 13 people. Kodak, which filed for bankruptcy a few months earlier, employed 145,000 people in its heyday. Innovation has brought great benefits to humanity. Nobody in their right mind would want to return to the world of handloom weavers. But the benefits of technological progress are unevenly distributed, especially in the early stages of each new wave, and it is up to governments to spread them. In the 19th century it took the threat of revolution to bring about progressive reforms. Today’s governments would do well to start making the changes needed before their people get angry. One area where cheap machines have made a radical difference is outdoor adventure photography - the video below was shot with a $300 GoPro camera mounted on a $700 drone helicopter - total cost probably 2 orders of magnitude less than the gear to shoot equivalent footage would have cost 10 years ago. ReNew Economy has a pair of articles looking at the benefits provided by solar power during the recent heatwave in southern Australia - Solar saved southern states from new and costly demand peaks. Victoria and South Australia have just finished a week which put the highest stress on the electricity grid since a similar heatwave occurred on 28th-30th January 2009. Despite the population of Victoria and South Australia increasing at least 7%2 since then, the electricity demand supplied by the grid during the heat wave was just lower than the peak usage reached on the 29th of Jan 2009. If no solar had been installed, Victoria would have set a new demand record of 10,675MW at 1:55pm today 17th-Jan-2014, higher than the metered demand of 10,572MW used at 12:35pm on the 29th-Jan-2009. South Australia would have set a new demand record of 3,549MW at 4:30pm yesterday 16th-Jan-2014, higher than the metered demand of 3,441MW set 4:25pm on the 29th-Jan-2009. Solar reduced the maximum combined VIC & SA demand by 448MW. Asking what happens when the sun doesn’t shine and the wind doesn’t blow ignores the spare capacity built into the grid to handle record demand days like yesterday and today. For the majority of the year, spare generation capacity can backup variations in solar or sudden failures at fossil fuel plants. Record demands, where there is little spare capacity, are caused by hot conditions and strong sunlight. Solar is now a critical component of the generation fleet that reliably supplies our power. An the second from Giles Parkinson - Solar puts heat on big generators as demand peaks subside. There seems no doubt that solar is playing a key role in moderating demand and stress on the grid. 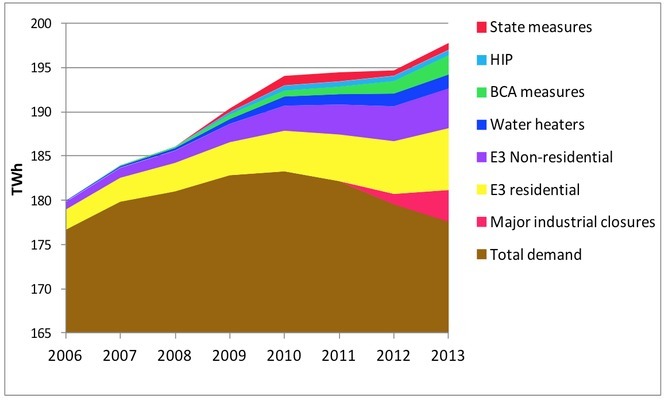 It’s interesting to note that the differences between the peaks of previous years – such as in 2009 when there was little solar – correspond with the amount of solar that has been installed (notwithstanding the need to add in population and air-con growth, offset by more energy efficient appliances and less manufacturing). On Wednesday, for instance, the interval peaks were 10,110 MW in Victoria and 3,108MW in SA. The corresponding numbers on January 29, 2009, were 10,446 MW and 3,270 MW. According to the APVI’s Live Solar website, the PV contribution at the peak times was around 220 MW in each state. Some suggest that without solar, Victoria would have hit record demand from the grid on Thursday – and prices to boot. In WA, the peak in electricity demand has fallen well short of previous years, despite the record-breaking streak of temperatures, rising population and growing use of air conditioning. In 2011 and 2012, peak demand peaked at more than 4,000GW. In the past week, it made it only as high as 3,733. How much solar does WA have on its rooftops? About 340MW. This has had an impact on peak pricing events. In 2009, the average spot price between 8am and 4pm was over $6,000/MWh. The average price – despite a few peaks – in the latest period has been about one tenth of that. On Thursday, the volume weighted pool prices between 08.00 and 16.00 yesterday were $299/MWh in Victoria and $377/MWh in South Australia, despite the huge levels of demand. 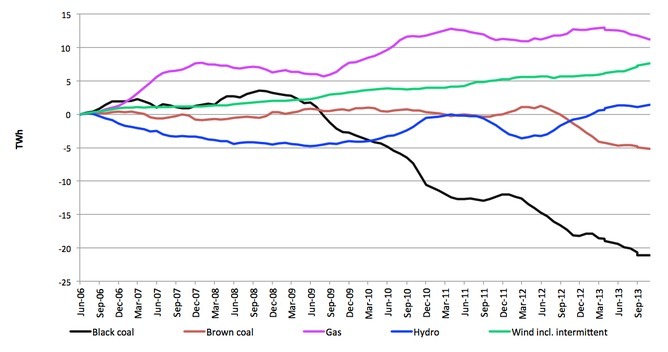 The reaching of super peaks of $12,000/MWh or more in Victoria occurred mostly when Loy Yang A – the biggest brown coal generator – had one of its four units off-line for urgent repairs . Generators and retailers use elaborate hedging policies to reduce their exposure to such fluctuations – which can be triggered as much by bidding tactics and other factors as much as weather – but the fact remains that a large revenue pool has been evaporated by the impact of solar. In the same way that one third of the network costs are to cater for about 100 hours of peak demand a year, generators source a huge amount of their annual revenue from similar events. The problem for many coal generators is that they grew to rely on these peak pricing events to boost their revenue, and inflate their values. Solar eats into those revenues whenever they produce – because the output comes during the day-time period, when prices are normally higher. While 2013 was Australia's hottest year ever apparently it was "only" the fourth warmest ever around the globe - Noaa: 2013 tied for fourth-warmest year on record. Last year was tied for the fourth-warmest year on record around the world. 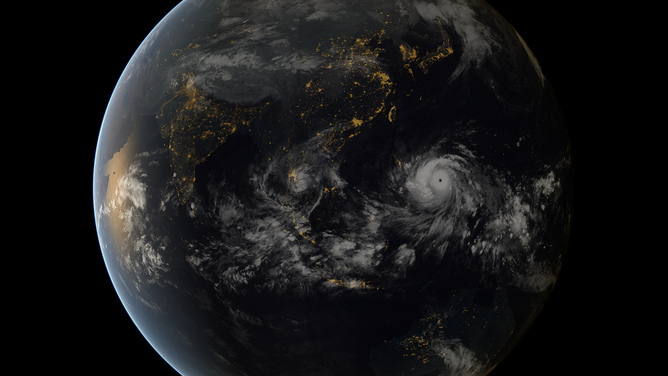 The National Oceanic and Atmospheric Administration on Tuesday released its global temperature figures for 2013. The average world temperature was 58.12F (14.52C) tying with 2003 for the fourth-warmest since 1880. ... Both agencies said nine of the 10th warmest years on record have happened in the 21st century. The hottest year was 2010. ReNew Economy has an article on a new report on the solar power industry by Deutsche Bank - Deutsche Bank predicts second solar “gold-rush”. Inside EVs has a report on the progress of Nissan's electric vehicle sales - Nissan Sells 100,000 LEAFs, Captures 48% Of Worldwide Market To Date. This past weekend Nissan announced that after just more than 3 years on the market, the LEAF had reached the 100,000 vehicles sold level. More impressive still is that InsideEVs calculated Nissan had only sold about 88,000 through the end of November, and the company themselves shortly thereafter announced reaching the 92,000 LEAF sold mark in early December - meaning the company has sold about 12,000 copies in the past two months worldwide. Overall, Nissan has captured 48% of pure electric sales worldwide since 2010 according to the company. Energy Bulletin has an article by Rob Hopkins looking at a collapse manifesto from David Holmgren (I feel like I've gone back in time about 10 years !) - Holmgren’s ‘Crash on Demand’: be careful what you wish for. It is a rare occurence that I disagree with David Holmgren. One of my heroes, and the co-founder of permaculture, I generally find his intellect formidable, his insights on permaculture revelatory, and his take on the wider patterns and scenarios unfolding around us to be deeply insightful. But while there is much insight in his most recent paper, Crash on Demand, it also raises many questions and issues that I'd like to explore here. I am troubled by his conclusions, and although I understand the logic behind them, I fear that they could prove a dangerous route to go down if left unchallenged. So what are the paper's core arguments? It picks up from his 'Future Scenarios' work a few years on, reassessing their relevance in a rapidly changing world (you can read Jason Heppenstall's summary of the new paper here). In essence, he has shifted to thinking that a gradual energy descent isn't going to happen. Rather than his Green Tech Future scenario which sees a concerted government response (similar to what we're seeing in Germany) or the Earth Stewardship scenario, an intentional powering down, he argues that in reality we are moving deeper and deeper into what he calls 'Brown Tech'. Brown Tech has emerged because "sustained high energy prices have allowed private and national energy corporations to put in place many new fossil and renewable energy projects that are moderating the impact of the decline in production from ageing 'super giant' fields". Most of these new fossil fuel projects, he argues, "generate far more greenhouse gases than the conventional sources they have replaced". The pace of the unfolding of climate change has outpaced expectations, and the world, if it continues to pursue Business as Usual, is still on course for a 6 degree rise in temperature, which would be catastrophic. He states that we have left it too late for a planned and intentional 'Green Tech' future, and the structural vulnerabilities of the economy mean that the currently emergent 'Brown Tech' future will be short-lived. He suggests that in this context, "severe global economic and societal collapse would switch off greenhouse gas emissions enough to begin reversing climate change", and that we should deliberately seek to make this happen. That troubles me. I have two key objections to the paper which I'll set out below. WA Election Setback Awaiting Abbott ? The BS has an article on a hideous, lager swilling beast that could cause problems for the Abbott government. While the initial image that comes to mind is Clive Palmer they are actually talking about the re-run of the Senate election for WA which could result in some hope returning for renewable energy programs and the carbon tax - A hideous beast awaits Abbott's return. The sun rises on 2014 with an unfortunate guest waiting patiently in the corner of the Liberal Party Room in parliament house, Canberra – a giant creature wearing a 'G'day from WA!' t-shirt, guzzling cans of Emu Export beer and belching with abandon. Nobody wants to sit next to the elephant in the room, but it is there. It's the half-Senate election re-run in Western Australia, and on it a great deal of Australian history will pivot. To re-cap, the first recount of the September election took weeks to complete. It was asked for by the Greens, who'd worked out that the direction of preference flows came down to a crucial moment in the first count that relied on other parties having a lead of just 14 ballot papers. Having found 'handfuls' of miscounted votes, the Greens thought they stood at least a 50/50 chance of returning Senator Scott Ludlam if a recount was approved. It was, and they did. Yet in that process, 1370 votes went missing, leading the sheepish Australian Electoral Commission to itself petition the High Court to declare the election result void (Abbott's nightmare is unfolding in WA, December 10). All things being equal, that would not present the returning Liberal Party members, and their Nationals colleagues down the hall, with that noisy, smelly pachyderm waiting to disrupt their first joint-party-room meeting. But there it is. Things are not equal. There is a major fork in the road ahead in 2014. Repeal of the carbon and mining taxes, the unpicking of the NBN legislation, and a host of other major agenda items for the Abbott government hangs in the balance. The Guardian has an article on a recent conference discussing peak oil - US Army colonel: world is sleepwalking to a global energy crisis. A conference sponsored by a US military official convened experts in Washington DC and London warning that continued dependence on fossil fuels puts the world at risk of an unprecedented energy crunch that could inflame financial crisis and exacerbate dangerous climate change. The dialogue opened with a presentation by Mark C. Lewis, former head of energy research at Deutsche Bank's commodities unit, who highlighted three interlinked problems facing the global energy system: "very high decline rates" in global production; "soaring" investment requirements "to find new oil"; and since 2005, "falling exports of crude oil globally." Lewis told participants that the International Energy Agency's (IEA) own "comprehensive" analysis in its World Energy Outlook of the 1,600 fields providing 70% of today's global oil supply, show "an observed decline rate of 6.2%" - double the IEA's stated estimate of future decline rate out to 2035 of about 3%. Lewis also referred to US Energy Information Administration (EIA) data showing that although global crude oil exports increased "year on year from 2001 to 2005", they "peaked in 2005 and have been trending down since 2009." Lewis attributed this trend to rapidly rising populations in the Middle East which has led to escalating domestic oil consumption, effectively eating into the quantity of oil available to export onto world markets. Reuters reports that the Dutch government is cutting back on gas production, citing earthquakes as the reason (some peak oilers are speculating they want to lengthen the life of the field to hedge against future supply disruptions) - Dutch to cut output from huge Groningen gas field. Platts says Europe expects to fill the shortfall with additional gas import from Russia. The Netherlands will cut gas production at Groningen, the largest gas field in western Europe, by about a quarter over the next three years, the Economics Ministry said on Friday, bowing to public concerns over earth tremors in the area. Gas from Groningen is sold mostly to utilities and large industries in the home market, although some gas is piped to Germany, Italy, France and Britain. The gas market has been expecting a decision to cut output, which has already driven up gas prices, analysts said. Off topic (Thailand has no significant fossil fuel resources) but I thought this report in the Sydney Morning Herald was interesting - Thai police release image of alleged grenade-thrower. For those who haven't been following Thai politics, the current government is a populist movement with it's support base amongst the rural poor (confusingly led by Thailand's richest man who is currently in exile in Dubai). The opposition is a strange coalition of monarchists, supporters of military rule and the urban middle class which has been doing it's best to destabilise the government, likely with the aim of provoking a military coup (one Bangkok based friend of mine says the middle class are basically cutting their own throats by supporting this, as they are hoping for an economically liberal government but will end up with an authoritarian military one). Two explosions about two minutes apart shook a protest site near Victory Monument in central Bangkok on Sunday afternoon, the second daylight attack using grenades in 48 hours. Police said footage shows the man tried to throw one grenade into a tent behind a rally stage but missed and the grenade hit the roof of a coffee shop and exploded. He threw another grenade and fired shots at protesters who started to chase him before flagging down a motor cycle taxi, police say. The attack comes as tensions soar in the city of 12 million people after a week of almost daily shooting attacks on protest sites and small explosives hurled at the homes of protest supporters. The footage has been released amid angry accusations over who was responsible for a blast on Friday in the middle of a protest parade that left one protester dead and 35 wounded. Police said for that blast they are seeking two men, one believed to be aide of a former opposition Democrat party MP who were seen in a video clip of the explosion. The Democrats support the protest movement trying to topple government of prime minister Yingluck Shinawatra, raising suspicion is was a staged attack designed to blame her supporters. Time has an interesting photo of a modern Beijing sunrise, brought to you by that wonderful substance, coal - Smog in Beijing Is So Awful You Have to Catch the Sunrise on a Big Screen. 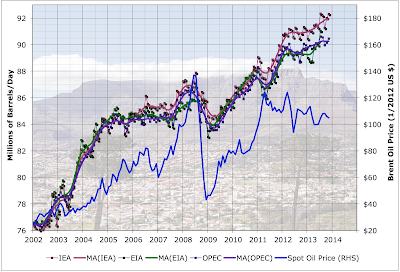 Peak Oil Is Irrelevant ? TreeHugger has a somewhat provocatively titled post proclaiming the end of peak oil - Peak Oil Is Irrelevant. Unlike the less informed articles of this type which predict a never ending gushing of unconventional oil at an indeterminate price this one correctly notes that while there may be a lot of unconventional oil out there (which traditional peak oil analysis ignored, to it's cost), the price point it is produced at and the alternatives available are what will shape the demand / supply curve into the future. The prediction that US oil production would peak in the 1970s was, in fact, accurate, but new discoveries – including North American sources involving fracking and tar sands – keep pushing the timeline outward. Some say we will always find new oil sources, though economic theory states they will also get inexorably more expensive. Recent discussions have revived the peak oil debate. A Business Insider article last spring claimed “it is probably safe to say we have slayed "peak oil" once and for all, thanks to the combination new shale oil and gas production techniques and declining fuel use.” It was counterpointed here. But I basically don’t care. The problem, as Sami Grover wrote in a Treehugger post in 2012, is not a lack of carbon-based fuels. The problem is that, if we use those fuels, the resulting greenhouse gas emissions will push the atmosphere far off the critical balance needed to maintain the climate. In other words, those sources – coal, oil, gas – must be left in the ground. Burning them is nothing less than suicide. The Guardian has an article on recent comments by Al Gore where he called geoengineering "utterly mad" - Al Gore says use of geo-engineering to head off climate disaster is insane. The draft climate report of the Intergovernmental Panel on Climate Change, due for release in Germany in April, said governments might have to turn increasingly to technologies for "carbon dioxide removal" to keep warming below the dangerous threshold of 2 degrees. The draft said those technologies might involve capturing and burying emissions from coal-fired power plants, or planting more forests. 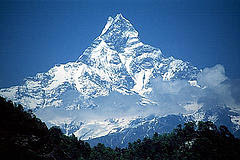 But there has been debate in the environmental community over other more radical solutions. On geo-engineering Gore drew a distinction between small-scale interventions, such as white roofs, and large-scale projects meant to extract or neutralise emissions from the air or block the sunlight. Those ideas, he said, carried enormous risks. "The most discussed so-called geo-engineering proposals – like putting sulphur dioxide in the atmosphere to reflect incoming sunlight – that's just insane. Let's just describe that clearly – it is utterly mad," Gore told the conference call. He warned that such large and untested experiments carried enormous risks while "doing nothing to address other consequences of climate change such as ocean acidification". He said: "We are already engaged in a planet-wide experiment with consequences we can already tell are unpleasant for the future of humanity. So the hubris involved in thinking we can come up with a second planet-wide experiment that would exactly counteract the first experiment is delusional in the extreme." Gore was also cool on the other quick-fix of nuclear power, advocated by some. ... Gore's re-thinking has apparently gone in the other direction. He told the call he had been an enthusiastic supporter of nuclear energy when he was in Congress. He was not opposed to nuclear energy now, he said. But he said the current state of technology in the nuclear energy industry did not yet warrant a big expansion. 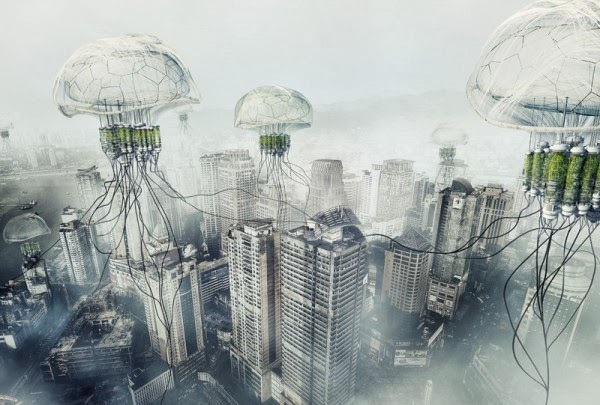 Cryptogon points to a Chinese geoengineering proposal, aimed at neutralizing acid in the air ("Ph conditioning") with giant jellyfish shaped blimp membranes - Atmosphere Processors for Beijing [???]. In the past 30 years, China has suffered from air pollution and heavy haze created by fast industrial growth and economic expansion. An Environmental Chemistry Letter research journal article reviews the techniques for remediation of air pollution. A geoengineering method is proposed for mitigating air pollution and haze in China’s cities by using water to scavenge air pollution. Here, water should be sprayed into the atmosphere like watering garden. The scientific rationale and mechanism for the geoengineering scheme are explained. The continuing heatwave in Australia and latest round of bushfires and brownouts resulting from it have highlighted the fact that coal fired power has intermittency problems - Victorian Senator's heat directed at wrong target. "Most of our power system performed very well under exceptional circumstances, but the large Loy Yang A coal-fired power station in the Latrobe Valley suffered unexpected outages for a long period of time as a result of the heat. No type of power plant can ever be 100 per cent reliable in extreme weather, but when a coal-fired plant suffers a fault the system loses a large amount of power. Wind farms and solar households are made up of thousands of independent generators, so a fault in one makes almost no difference. “Without rooftop solar power and solar hot water acting to reduce the demand from large-scale power stations, it is very likely that Victoria would have set a new record for power use. And without the contribution from wind and solar energy, more homes may have had their power switched off over the last few days,” he said. Mr Sonnreich said the Renewable Energy Target had been very successful at delivering large amounts of clean energy from solar power, solar hot water and bioenergy at low cost to consumers, while delivering billions of dollars of investment and tens of thousands of jobs in regional areas. The dawn of the gas age has made GTL an interesting prospect for those seeking to profit from the age of expensive oil. Technology Review has a look at a new technique for turning natural gas into liquid fuel - Chasing the Dream of Half-Price Gasoline from Natural Gas. At a pilot plant in Menlo Park, California, a technician pours white pellets into a steel tube and then taps it with a wrench to make sure they settle together. He closes the tube, and oxygen and methane—the main ingredient of natural gas—flow in. Seconds later, water and ethylene, the world’s largest commodity chemical, flow out. Another simple step converts the ethylene into gasoline. The white pellets are a catalyst developed by the Silicon Valley startup Siluria, which has raised $63.5 million in venture capital. If the catalysts work as well in a large, commercial scale plant as they do in tests, Siluria says, the company could produce gasoline from natural gas at about half the cost of making it from crude oil—at least at today’s cheap natural-gas prices. If Siluria really can make cheap gasoline from natural gas it will have achieved something that has eluded the world’s top chemists and oil and gas companies for decades. Indeed, finding an inexpensive and direct way to upgrade natural gas into more valuable and useful chemicals and fuels could finally mean a cheap replacement for petroleum. Natural gas burns much more cleanly than oil—power plants that burn oil emit 50 percent more carbon dioxide than natural gas ones. It also is between two and six times more abundant than oil, and its price has fallen dramatically now that technologies like fracking and horizontal drilling have led to a surge of production from unconventional sources like the Marcellus Shale. While oil costs around $100 a barrel, natural gas sells in the U.S. for the equivalent of $20 a barrel. But until now oil has maintained a crucial advantage: natural gas is much more difficult to convert into chemicals such as those used to make plastics. And it is relatively expensive to convert natural gas into liquid fuels such as gasoline. It cost Shell $19 billion to build a massive gas-to-liquids plant in Qatar, where natural gas is almost free. The South African energy and chemicals company Sasol is considering a gas-to-liquids plant in Louisiana that it says will cost between $11 billion and $14 billion. Altogether, such plants produce only about 400,000 barrels of liquid fuels and chemicals a day, which is less than half of 1 percent of the 90 million barrels of oil produced daily around the world. The Independent has a report on the shrinking of Antarctica's Pine Island glacier - Pine Island Glacier melting past 'the point of no return'. Antarctica’s Pine Island Glacier could now be in a state of irreversible retreat, making it likely to become an even more significant contributor to the global sea level rise during the next two decades, scientists have warned. The research, published in Nature Climate Change, found that in recent years, the grounding line, which separates the grounded ice sheet from the floating ice shelf, has retreated by tens of kilometres. An international team of scientists from the CSC-IT Center for Science in Finland, the Chinese Academy of Sciences and the Universities of Exeter and Bristol combined field observations and computer models to predict how the ice will change over the next few years. Their research concluded the recent Pine Island Glacier thinning has probably “reached a point of no return”, according to the British Antarctic Survey (BAS). This glacier is currently responsible for contributing 25 per cent of the total ice loss from West Antarctica, which the BAS say is likely to increase over the next 20 years. Dr Hilmar Gudmundsson from the BAS said: "At the Pine Island Glacier we have seen that not only is more ice flowing from the glacier into the ocean, but it's also flowing faster across the grounding line - the boundary between the grounded ice and the floating ice. We also can see this boundary is migrating further inland. “The Pine Island Glacier shows the biggest changes in this area at the moment, but if it is unstable it may have implications for the entire West Antarctic Ice Sheet. Crikey has an article on the desperate conservative backlash against renewable energy - Tony Abbott’s half-baked war on renewable energy. Last week it was quietly announced that the Australian Cleantech Competition would henceforth be known as the Australian Technologies Competition. It was another subtle reminder of how the new Australian conservative government is going about the rephrasing of Australia’s energy future. Anything that involves the words climate, clean energy, or cleantech are considered projects or institutions non grata. In the public arena, it’s not just a renaming that’s taking place, but a concerted attack on renewables. For the second time in as many weeks, Prime Minister Tony Abbott has criticised renewable energy, its intermittency and its supposed costs — repeating the force-fed lines from his main business adviser, Maurice Newman, extremist blogs and some mainstream media, and encouraged by the fossil fuel incumbents, whose greatest fear is that their coal- and gas-fired generation is being sidelined and rendered unprofitable by the growing capacity of wind and solar. Abbott’s complaints fail on numerous counts. For a start, the Renewable Energy Target is having little impact on retail prices. The Queensland Competition Authority notes in its latest finding that the large-scale renewable target (the apparent subject of the new government’s attacks) will cost Queensland households $26 a year, or about 1.3% of their bills — about half the rise in retail bills caused by soaring gas prices. Wind and solar do not need new back-up power. South Australia has got to 31% wind and solar without the need for any new equipment. That’s because most of the peaking plants that respond to changes in demand — and supply — already exist to cope when a whole bunch of people switch on air-conditioners at the same time, or when coal- or gas-fired generation has unexpected shutdowns, such as when the Millmerran coal-fired generator shut down last March, or the two major gas generators lost large amounts of capacity in South Australia. The difference with wind and solar is that at least their output is predictable. Abbott’s outburst are cheered, and sometimes inspired from the sidelines, by elements of the mainstream media. The Australian took another bash at Germany last weekend, which it likes to cite as what happens to a country when it moves away from baseload — coal and nuclear — and towards renewables. The newspaper’s principal complaints were there were more coal plants, more emissions, and more costs. Germany is the nightmare scenario for the fossil fuel industry because if the biggest manufacturing economy in Europe can wean itself off nuclear, coal and gas, then so can everyone else — which is why its policies are attacked with such gusto. What The Australian omits to tell its readers is that coal-fired generators coming on line now were planned and construction was begun well before Fukushima, and before the extent of the rapid growth in renewables was acknowledged. The net impact is a lot more coal projects are being abandoned. The country’s big three utilities — RWE, E.ON and Vattenfall — have made it clear they intend to build no new fossil fuel plants, because some of them are having to close new plants almost as quickly as they are opened. Investment bank UBS, for instance, predicts that one-third of Germany’s fossil fuel capacity will need to be closed by 2017 because it is no longer economic, and they are no longer needed. Germany industry has not been affected by the renewable energy roll-out because it is only charged the wholesale price of electricity, plus a margin. Its costs have fallen substantially in recent years, not risen. To try and illustrate its lament, The Australian sought to create drama by pointing to a period in early December when renewables contributed just 5% of generation needs on some days. I presume these charts reflect the issue. Actually, it’s not the dips that are worrying the incumbent utilities or the grid operators — it’s the big lumps of clean energy that are forcing their generators offline when they produce. Currently, Germany gets just under 25% of its electricity from renewables over a year, and this will rise to around 60% by 2035 (the new government’s new target). As that happens, those gaps will disappear, the lumps will get bigger, and new storage solutions will mean there will be even less need for fossil fuel or “baseload” generation. A similar scenario would take place in Australia, which is why the incumbents are so keen to neuter the Renewable Energy Target so they can extend their revenues as far as possible. The Climate Spectator has a look at the collapse of the "nuclear renaissance" - The nuclear renaissance is stone cold dead. The figures are in: 2013 was an annus horribilis for the nuclear power industry − its third in a row − and the nuclear renaissance can now be pronounced stone cold dead. The most that could be said for the 2013 figures − four reactors connected to grids, four permanently shut down − is that they weren't as bad as the previous year. Nuclear power suffered its biggest ever one-year fall in 2012 − nuclear generation fell 7 per cent from the 2011 figure. Nuclear generation fell in no less than 17 countries, including all of the top five nuclear-generating countries. Nuclear power accounted for 17 per cent of global electricity generation in 1993 and it has steadily declined to 10 per cent now. The International Atomic Energy Agency has downwardly revised its projections, and now anticipates nuclear capacity growth of 23 per cent to 100 per cent by 2030. Historically, the IAEA's upper projections have been fanciful, while its low projections also tend to be too high (by 13 per cent on average) but provide a reasonable guide nonetheless. So growth of 23 per cent by 2030 − annual growth of a little over 1 per cent − is about as much as the industry can realistically hope for. The IAEA will further reduce its projections when it factors in last year's annus horribilis. Perhaps the most striking developments were in the United States, where the industry is finding it increasingly difficult to profitably operate existing reactors − especially ageing reactors requiring refurbishments − let alone build new ones. Almost half of the world's reactors have operated for 30 years or more, so the problem of ageing reactors is starting to come into sharp focus. Peter Bradford, a former member of the US Nuclear Regulatory Commission, notes that by 2009, applications for 31 new reactors in the US were pending. "The 31 proposed reactors are down to four actually being built and a few others lingering on in search of a licence, which is good for 20 years," Bradford writes. "Those four are hopelessly uneconomic but proceed because their state legislatures have committed to finish them as long as a dollar remains to be taken from any electric customer's pocket. Operating reactors are being closed as uneconomic for the first time in 15 years." ReNew Economy has an article on a recent report from UBS on the outlook for power utilities - UBS: Utilities face “perfect storm” from renewables, storage. A new report from leading utilities analysts at investment bank UBS suggests that energy utilities in Europe, north America and Australia are facing a “perfect storm” from the falling costs of renewables, energy efficiency and falling demand, and may not be able to sustain their business models. The report – entitled “Can utilities survive in their current form?” – is the latest in a series of assessments, reviews and analysis that point to the severe disruption to the centralized generation model, and the demand and supply dynamics that have governed the industry for the past few decades. To briefly summarise the UBS response to its own question, the answer is No. This, says UBS, will cause profits to fall and could force utilities, particularly generators, to look at greater exposure to renewables and distributed generation, and to other downstream services. It comes to a similar conclusion on this as the CSIRO Future Grid forum, and echoes some of the strategic decisions currently being mooted German energy giants RWE and E.ON. These new business models could include a greater focus on rooftop solar, energy efficiency, and consumer offerings that combined solar, storage, and electric vehicle infrastructure, as well as energy-efficient appliances. TreeHugger has a post on some Bucky Fuller designed structures that have been rediscovered in New Jersey (prompted by this article in Gizmodo and the NYT) - Bucky Fuller's grain silo houses found in New Jersey. In 1940, before the Wichita House or the geodesic dome, Bucky Fuller was fascinated by the technology used to build grain silos. ... Unfortunately steel was in demand for weapons, not houses, so they were never produced in volume. A dozen of them survive at Camp Evans in New Jersey, a remarkable story of architectural preservation. Is time up for Australia's uranium industry ? Following the latest spill of radioactive material at ERA's Ranger uranium mine he ABC has an opinion piece wondering if it is time to decommission the industry - Is time up for Australia's uranium industry ?. IN THE EARLY HOURS of December 7, a crack appeared in a large leach tank in the processing area of the Ranger uranium mine in Kakadu National Park. The area was evacuated, the tank completely failed, the containment system was inadequate and one million litres of highly acidic uranium slurry went sliding downhill — taking Energy Resources of Australia's credibility with it. The spill has left traditional owners who live and rely on creeks only kilometres downstream angry and "sick with worry" and raised profound concerns about the management culture and integrity of infrastructure at the mine. Operations at Ranger are now halted. The mine operates inside Kakadu National Park — Australia's largest park and a dual World Heritage listed region. It, and its people, deserve the highest standards of protection, but sadly Ranger is a long way short of this. The Australian uranium industry has long been a source of trouble. Now it is increasingly in trouble. The commodity price has collapsed, projects across the country have been stalled, deferred or scrapped and the recent Kakadu spill has again raised community attention and concern. At least the absence of a nuclear power industry in Australia means we don't have stories emerging like this one from the US - U.S. Dumped Tens of Thousands of Steel Drums Containing Atomic Waste Off Coastlines . More than four decades after the U.S. halted a controversial ocean dumping program, the country is facing a mostly forgotten Cold War legacy in its waters: tens of thousands of steel drums of atomic waste. From 1946 to 1970, federal records show, 55-gallon drums and other containers of nuclear waste were pitched into the Atlantic and Pacific at dozens of sites off California, Massachusetts and a handful of other states. Much of the trash came from government-related work, ranging from mildly contaminated lab coats to waste from the country’s effort to build nuclear weapons. After last year's record breaking temperatures we are having a hot start to 2014 in Australia as well (apparently it reached 54 degrees in inland South Australia) - Heatwave hits inland Australia. On Thursday temperature records again tumbled in central, western and north-west Queensland, with the mercury topping 40 degrees Celsius in a number of areas. "Century Mine in the far north-west of the state got up to 44.6 today, Camooweal 45.5, a new January record, the Monument Airport 45.9, another January record," said the weather bureau's Peter Otto. "Bedourie police station [recorded] 47.3 [degrees], which is an annual extreme for them, and Birdsville got up to 48.6." The Washington Post has a graph from Bill McKibben showing the unsustainable growth in extraction of fossil fuels - Bill McKibben’s graph of the year: We’re extracting more fossil fuels than ever. The chart in this post, showing that even as [the United States] makes minor reductions in carbon-dioxide emissions domestically, we are mining and drilling for ever more coal and oil and gas, seems to me crucial. It demonstrates sadly that we really haven't spent the Obama years working out a new relationship with fossil fuel, which is what we needed to do. The WaPo also has a graph from Vaclav Smil showing the divergence of global oil prices and US natural gas prices - how much of this gap will reverse when the investment boom in shale plays fades away and the underlying economics become clear remains to be seen - Vaclav Smil’s graph of the year: The natural-gas boom. After some weird political theatre from one of the more paranoid members of the government this week the annual temperature records were released, with Australia easily recording its hottest year ever - Record sparks hot debate on Tony Abbott's climate policy. Australia smashed its previous annual heat record in 2013, sparking renewed political debate about climate change. The Bureau of Meteorology on Friday confirmed that last year was the hottest nationwide in more than a century of standardised records, with mean temperatures 1.2 degrees above the 1961-90 average. The 12 months easily eclipsed the previous annual record set in 2005, when mean temperatures were 1.03 degrees above average. ... By maximums, all but Victoria and Tasmania recorded their hottest years, with nationwide maximums a full 1.45 degrees above the long-term average, shattering the previous record of 1.21 degrees in 2002. Stuart at Early Warning has returned with one of his once monthly oil supply updates - Oil Supply Update. 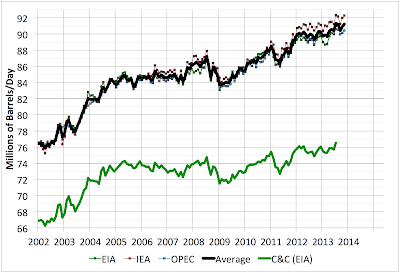 This last picture shows also (green line) the narrower definition of oil given by "Crude and Condensate", which has been flatter than the "all liquids" represented by the black line.